It is an honor to serve as the next Editor of 1775. 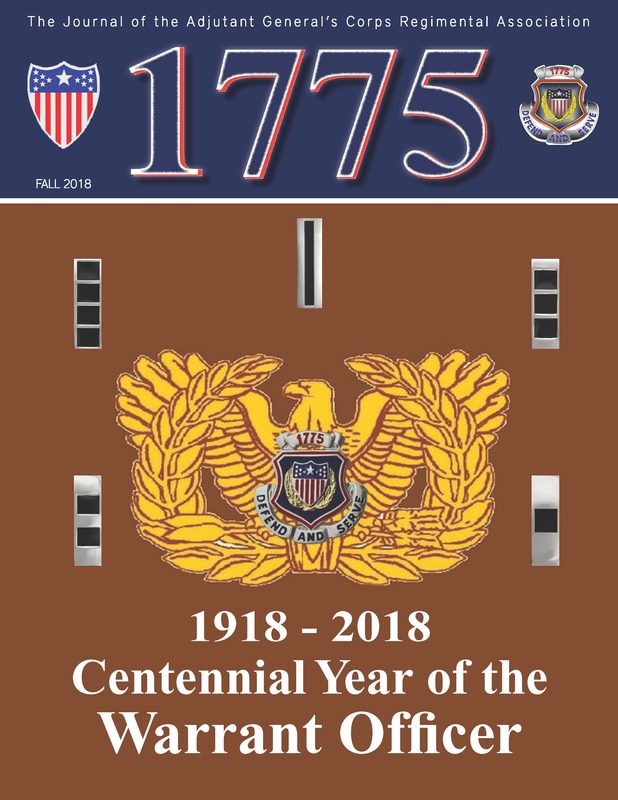 It is especially gratifying that my first edition as Editor is dedicated to the “Centennial Year of the Warrant Officer.” Warrant Officers are the touchstone of the AG Corps. Often behind the scenes, these quiet professionals are the Army’s Subject Matter Experts who serve at the highest levels within our Army and the Department of Defense. As a young Captain, my first exposure to our professional HR Warrants was during my time as the Battalion S-1 / Adjutant while assigned to the 556th Personnel Services Battalion at Schofield Barracks, HI. I was astonished at the knowledge, tact, and flexibility of both then CW3 Gerald I. Sims, Jr., and CW2 Lisa L. Taylor. I soon learned they were the “go to” Warrants for all things HR. They, like the vast majority of our HR Warrant Officers, are not only experienced but care and diligently seek to serve our Soldiers, Families and Army Civilians. CW3 Sims and CW2 Taylor had phenomenal careers serving as advisors and confidants to the Army’s senior leaders. CW5 (Ret) Sims, now serves as the AGCRA’s Honorary Warrant Officer, and he is still serving our Army at Human Resources Command as the Deputy Chief, Army Personnel Records Division. Mr. Sims not only takes care of today’s Soldiers, but he also serves the many Veterans and Retirees throughout the Nation. For myself, as a Civilian working at the Adjutant General School, I not only seek advice from our current HR Technicians but I also frequently discuss today’s HR “Hot Topics” with CW5 (Ret) Pamela Johnson and CW4 (Ret) James Fiedler. I know I can count on our HR Warrants to lead and serve the Army. Finally, I would like to thank the previous 1775 editors, MAJ (Ret) Alisha Sanders, MSG (Ret) Phillip Johnson and foremost my immediate predecessor, COL (Ret) Robert (Bob) Ortiz-Abreu, Jr. Bob spent countless hours assisting with the publication of this edition, and I value his mentorship, guidance and his years of selfless service to the Regiment and its members. I desire that I too can deliver a professional publication that both educates and entertains while also stimulates spirited discussion on issues facing our AG Corps today. We hope you enjoy this edition of 1775 and solicit your comments and feedback at magazine@agcra.com.